Expectations? – odd title but prompted by a friend who asked my view on a Patek Philippe model which was on sale for around £5000+ and quartz powered! Now I don’t know about you but when I think of the Patek Philippe brand I’m thinking absolute quality. I’m thinking beautifully sculpted and finished mechanical movements and clever fashionable designs – and like the advert – so refined and just so good that it passes down the generations, time after time. The buyer pays for the privilege of wearing such a powerful statement, often hidden by an understated refinement it simply speaks class. You’re someone who’s “made it” so to speak and with an implied old money elegance and sophistication in comparison to the ubiquitous and often ostentatious Rolex. Now you know perfectly well that a quartz model won’t quite be the same as their classics, but that said, perhaps you’re also not quite expecting the plastic/metal module, a few gears, a couple of coils and a battery – right? And being a Patek Philppe you’d expect that battery to last a lifetime and probably your son’s too, seeing you passed it down to him when you finally quit the rat race. But it doesn’t and the image here with the back removed shows a typical PP quartz sporting what’s probably a good old Renata SR371SW costing under £2.00. But got this! 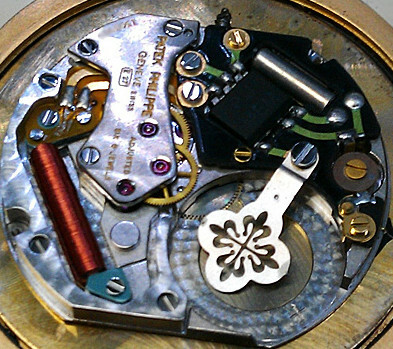 (Quartz calibre) with battery removed. So it’s hardly surprising that when I see a not so old vintage “quartz” Patek for over £5000+ – I really struggle to see the value, especially when I open up the back and see a few soldered joints and that common old battery sitting there. Nice bit of fret work on the battery holder I agree, but for me it doesn’t feel like a whole lot of money. It’s like retrofitting a Mini engine into a Rolls – it just doesn’t seem right. That’s not to say it isn’t good, because Patek Philippe is good but is it really value? And of course that’s another matter completely – value – because the very top brands simply rise above the common concept of “value” as such and enter a different world with both a monetary and status value entirely of their own making. One of the plus points regarding quartz watches is that you can pop off the back yourself and swap out the battery – it doesn’t take a great deal of skill and it’s usually done in minutes. But how many owners of Pateks ever take the back off their prized model and to gaze on that wonderful calibre, or in this case that rather common looking quartz movement. And unless they have an exhibition back in most cases the internals will never ever be seen. And regarding the quartz version – well you could look at it in another way – it’s just a change of power source. Everything is the same, it’s a power source thing and instead of that mainspring, hairspring, regulators and associated gears and stuff you’ve got a battery. Not an 18ct gold one but a £1.50 one and the whole shooting match is really accurate. OK? Well no it doesn’t work for me either. However the top brands, if quartz, are sometimes not like the plastic digital modules and basic mechanics of lesser brands and some feature pretty smart metal work inside and that’s maybe as it should be considering the brand, but it’s still a quartz job whatever you say. Always amazed that such a simple change – battery instead of spring can make such a vast difference. Perception is everything. But for me though as I like quartz watches (let’s face it, they keep better time than mechanical ones) it has to be a question of price, of value, which maybe shows my class or maybe lack of it, because to me price matters. Perhaps I’m not cut out to be a true Patek Philippe owner. After all as a collector I don’t even have a Rolex! Though in saying that, if a classic mechanical automatic Patek Philippe came along, at a quiet little auction somewhere and at a good price I would probably be very tempted. But there again I do have Breguet and Vacheron and a few others in the same league, so maybe it’s just a question of preference and I hasten to add none of them are quartz. 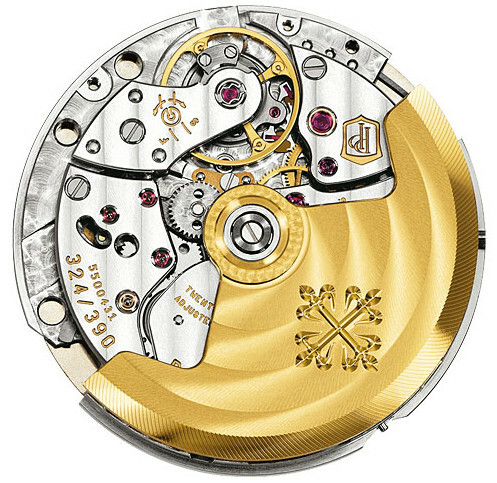 However there are other quality brands offering Quartz versions, allegedly to suit the Ladies market – one of the reasons apparently is that ladies don’t want the tiresome business of winding their watch every so often and automatics are just so expensive. PP seemingly offer them partly as a recognition of the historical significance of quartz too and of course for the “ladies” and an odd few for gents. Though get one of those and it usually is not that easy to sell on, let alone leave it to your offspring! It could be “that” heirloom that gets passed around! Friends are likely to say – “Oh I know he’s got a Patek, but it’s quartz would you believe!” Almost into the realm of fakes dare I say! But as I said, there are others, such as Cartier, who produce quartz versions very successfully and with somewhat more conviction. 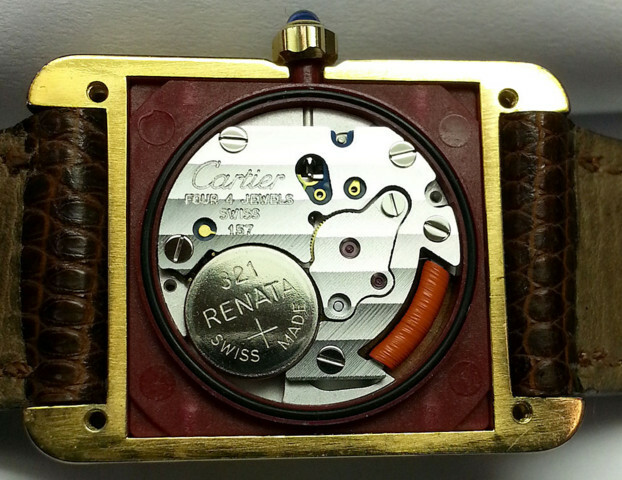 The Gents Cartier Solo model is one. And yes this is one of a few “brand” quartz models I do own and personally I love it. Firstly as it is so well priced (around £1200 new) and secondly as it has a flat tank profile as opposed to the rounder tank case – and definitely I prefer the former. It’s neater and it sits better on the wrist. And I can live with the fact that the battery only costs around £1.50 and I can change it myself in minutes when required. It’s probably got a jewel or two added in but basically it’s a quartz module like any other. It is what it is . . . . But what it isn’t is £5000+! And maybe that’s the point for me. The fact that if the wonderfully intricate mechanics of the mechanical movement have been replaced with a modern day quartz mass produced drop-in battery timer, then I’d want a really big price reduction to compensate for that loss. 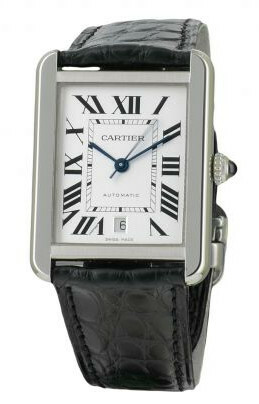 And in that regard Cartier have got it just about right. And at the end of the day it has to be about price. However if I was paying that “I’ve made it status” asking price for that top brand, I’d want to see it at it’s best. The best workmanship, the best mechanics, the best style. And for the privilege of owning such a timepiece I’m perfectly happy (if a manual model) to wind it up every day or two, just to remind me its there. And I suppose that’s one of the reasons I got into watch collecting in the first place. The fact that once you take the back off a watch you are suddenly into another world. The reflections off the finished plates and the beating heart of the miniature mechanics, ticking away virtually silently – alive – as time measures it’s way onwards . . . . Wow!